One of our festival activities this summer was a sensory tray filled with blue rice and lots of sea creatures and shells to go with the underwatre theme at Deershed Festival. All the children (and some of the big people) really loved the feel of this rice, playing at scooping it up and running it through their fingers. It’s great for making sensory trays if you have a little one who doesn’t really like things which feel gooey or wet. 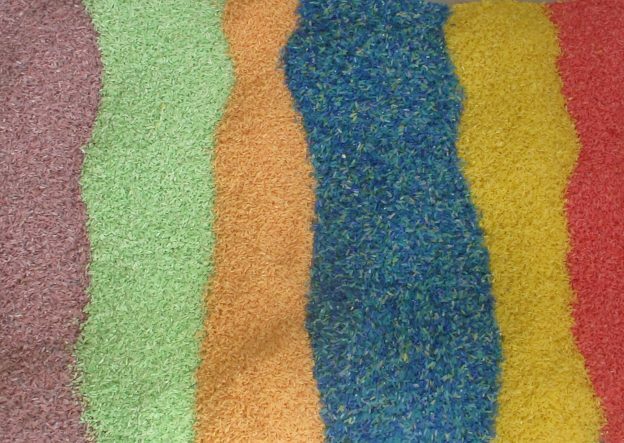 Here is how you can make coloured rice easily at home. Tip your rice into a ziplock bag then add in a splash of vinegar (preferably a clear kind) and a squirt of liquid food colouring or a little blob of colouring paste. You just need enough vinegar to help the colour mix through the rice and you can always add more if needed or more colour if it’s too pale. You then need to squeeze it about in your bag till you have coated all of the rice in colour. Then you can either tip it onto a tray to air dry or, if yo u’re impatient like us, pop it in a really low oven. It might stick a bit as it dries but if you give it a squash around it separates out again nicely. It also doesn’t rub colour off if little ones have sticky hands which is the problem if you use paint instead of food colour. Some people add a drop of something that smells nice to take away the vinegar smell but we prefer just to leave it out for a while and a bit of a vinegary taste might stop nibblers anyway. We did a few different combinations of blues and greens so that it looked nice when we mixed them all up together. You can store the rice in either an air tight tub or bag and it seems to last for ages. We have some that’s 6 months old and seems fine but usually we have spread it everywhere before it makes it that far. Luckily it’s easy to hoover up! As this is all non-toxic food stuff you don’t need to worry as much about little ones having a taste – and if they do have a nibble it tastes pretty yuck anyway so they shouldn’t do it again! As always though, this recipe is for playing together with your little one and needs to be fully supervised to keep it safe and avoid choking. This entry was posted in Sensory Play Ideas on 27th August 2018 by Josephine Ross.